In England’s Somerset County, the West Country Farmhouse Cheesemakers have been causing a stir with their “Cheddarvision TV” – a website that features live images of a 44- pound cheddar round that is maturing in the Westcombe Dairy. A recent New York Times article highlighted the dairy, citing Cheddarvision TV’s 900,000 viewings and the 15 minutes of fame received by the ripening cheddar itself, which receives everything from holiday cards to poems and wedding invitations. The cheese now even has it’s own MySpace page. 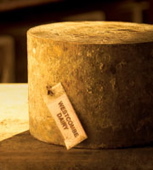 Dom Lane is a spokesman for the West Country Farmhouse Cheesemakers – he gives a brief history of Cheddarvision, discusses the fascination behind it and even gives a few tips about food and drink pairings with cheddar cheese.